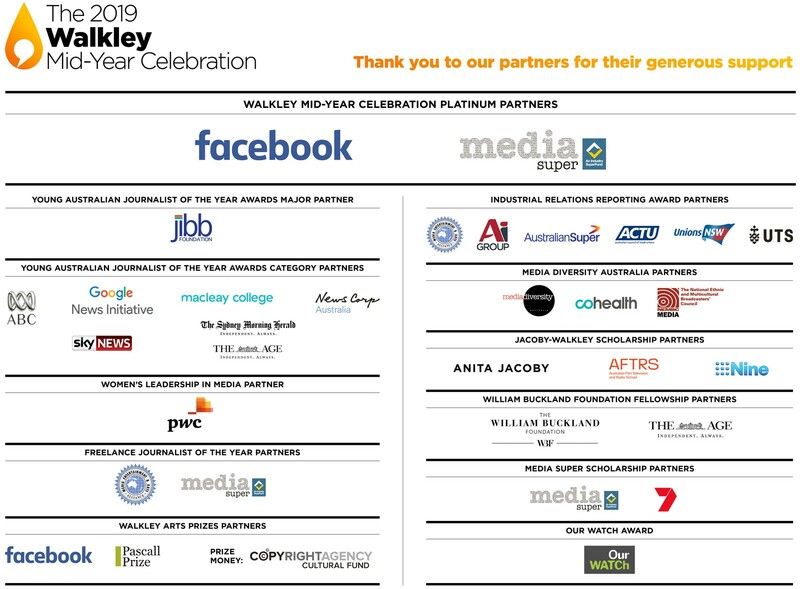 Entries are now open for the range of prizes and awards given out at the Walkley Mid-Year Celebration. Entries close at midnight on April 26. Click on the relevant award below to view all the details and enter online. These awards recognise and reward the hard work of our most outstanding young Australian journalists. These awards will recognise the work of journalists aged 28 and under who demonstrate excellence in the fundamental tenets of the craft as well as the ability to present distinctive and original journalism that pushes the boundaries of the profession. The Walkley Young Australian Journalist of the Year will be chosen from the winners of the above categories. To make the awards even more accessible and valuable to a diverse range of young reporters, a philanthropic grant from the Jibb Foundation subsidies entry fees allowing them to remain at $50, with the exception of the Student Journalist of the Year category, which is free. Entry remains free for MEAA union members. The Freelance Journalist of the Year recognises the unique contribution that freelance journalists make across all media platforms to the future of the industry and is open to residents of either Australia or New Zealand. The award is an initiative of the Walkley Foundation in partnership with Media Super and MEAA. The winner will receive two tickets to the Walkley Awards Gala Dinner. This honours women who are making a outstanding journalistic contribution to gender equality and the visibility of women in society – both in Australia and on a global scale. It celebrates reporting that demonstrates notable innovation, enterprise or courage in raising awareness of women’s experiences and perspectives, and reflects the significance of media coverage in altering perceptions, challenging stereotypes and fighting misinformation.Women’s Leadership is self-nominated and open to women working in media that’s mainstream or alternative, collaborative or individual. The Helen O’Flynn & Alan Knight Award for Best Industrial Reporting is an all-media award recognising outstanding journalism which captures the importance of a robust industrial relations ecosystem for Australian workers and businesses, as well as its complexities. Journalists working in all media were encouraged to apply and need not be designated Industrial Relations reporters. This prize recognises a significant contribution in reporting, writing, news-breaking and analysis of arts issues. This may include profiles of artists, features and investigations, reporting on the structures and personalities involved in the creation of contemporary culture, and examination of the creative arena. Entries in this category must be a single piece of work or a series of no more than three related reports. Open to individuals or group entries up to three people. The Arts Criticism prize previously the Pascall Prize, celebrates the unique contribution of critics to our cultural landscape, and the specialist, detailed knowledge they draw on to contextualise works of art. Criticism includes both reviews responding to the work itself, and deeper criticism placing work in the context of the artist’s oeuvre, specific genres and/or the current social/political/cultural landscape. Judges will consider critical thinking, balanced, rigorous argument and evaluation, depth of knowledge and ability to contextualise, and engaging, illuminating voices. Entries in this category must be a single piece of work or a series of no more than three related reports. Open only to individual entrants. The Our Watch Award for excellence in reporting on violence against women and children recognises the work of an individual, team or news organisation in highlighting the drivers of gendered violence and the way these intersect with other forms of discrimination and abuse faced by victims. Eligible formats include rolling coverage or a series of news reports or features, or one longform piece. Entries can be examples of journalism of any medium (text, radio or visual) and published on any platform (print, broadcast, online and through social media). The Media Diversity Australia Award honours journalists who are making an outstanding contribution through their reporting or coverage of diverse people or issues in Australia. This includes culturally and linguistically diverse communities (CALD) and people with disability (PWD). It celebrates reporting that demonstrates notable courage in raising awareness of CALD and/or PWD experiences and perspectives, as well as innovation in the telling of these stories. It recognises the significance of media coverage in providing nuanced reporting which serves to alter perceptions and attitudes, challenge stereotypes and fight misinformation. The Industrial Relations Reporting Award receives philanthropic support in memory of Emeritus Professor Alan Knight.